• Falcons RBs Devonta Freeman and Tevin Coleman combined for 1,493 yards and 12 rushing touchdowns last season. They averaged 4.3 yards per carry (86 yards on 20 carries) against the Eagles in January. • Freeman and Coleman rushed for 70 yards on their first 13 carries against the Eagles, but gained just 16 yards on their final seven rushing attempts. • The Falcons averaged 4.43 yards per carry on first down against the Eagles in January. The Eagles had held opponents to 3.37 yards per carry on first down in the regular-season, which was the fourth best mark in the league. Coleman gashed the Eagles for 61 yards on seven first-down runs. And the Eagles had linebacker Nigel Bradham in that game. They won't have him tonight. 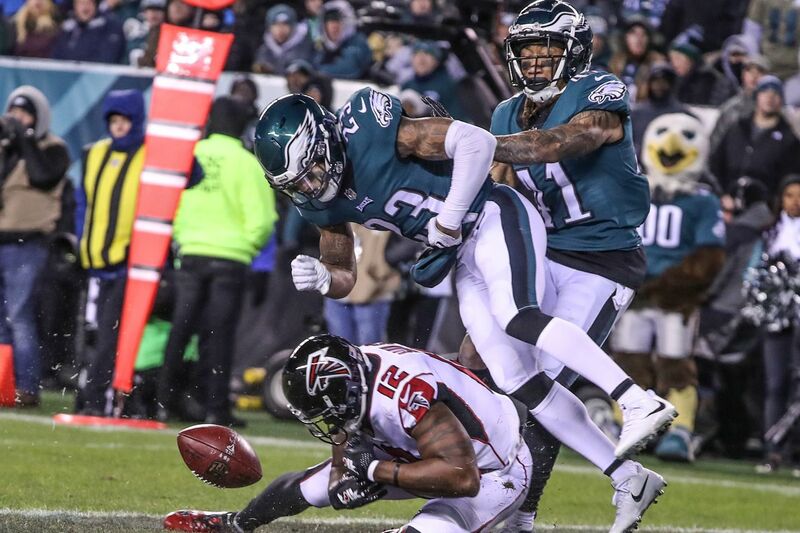 • Wide receiver Alshon Jeffery, who still is recovering from rotator cuff surgery and won't play tonight, had four catches for 61 yards in the Eagles' playoff win over the Falcons. All four resulted in first downs. He had a 15-yard catch near the end of the first half that put the Eagles in range for a 53-yard Jake Elliott field goal. His other three receptions came on a 12-play, 74-yard scoring drive in the third quarter that also resulted in an Elliott field goal, including a 12-yard catch on second-and-8 and a 21-yard grab on third-and-8. >> READ MORE: Film review | How can the Eagles beat the Falcons (again)? • Nick Foles was sacked just once by the Falcons in January. They hit him three times and had five hurries as Foles completed 23 of 30 passes for 246 yards. He was 5-for-7 for 70 yards on third down. Four of his five third-down completions resulted in first downs. • The Eagles used "11" personnel (1RB, 1TE, 3WRs) on 42 of 63 plays against the Falcons (66.6%). That's only slightly higher than their regular-season use of the personnel grouping, when they used "11" on 65.1% of their plays. • Falcons QB Matt Ryan was 7 for 10 for 61 yards and a touchdown on third down against the Eagles. But just three of his seven third-down passes resulted in first downs. The Falcons converted just 4 of 13 third-down opportunities in the game. • Two of the Eagles' three sacks against Ryan came on blitzes. They only sent extra rushers (five or more) on eight of the Falcons' 39 pass plays. • Nick Foles had a prolific postseason. He finished with a 115.1 passer rating in the Eagles' three wins, and had a not-of-this-world 158.1 postseason passer rating on third down. His third-down passer rating in the playoffs was the best in league history. • Foles completed 26 of his 32 third-down attempts in the playoffs. Twenty-two of his 26 completions resulted in first downs. Four of his six postseason TD passes were on third down. • Foles had a poor preseason. He played 51 snaps and 10 possessions. The Eagles didn't score on any of the 10 possessions. He turned the ball over on five of those 10 possessions and had a 48.7 passer rating. • Foles was 8 for 15 for 274 yards and 4 TDs in the playoffs on throws that traveled 20 or more yards in the air. Carson Wentz was 22 for 65 on 20-plus yard throws before he injured his knee in Week 14. • Foles had a 122.8 passer rating in "11'' personnel packages (1RB, 1TE, 3WRs) in the playoffs. He completed 58 of 72 passes for 751 yards and 4 TDs in "11'' (80.0%). He had a 102.2 passer rating in "12'' (1RB, 2TEs, 2WRs), completing 15 of 26 passes for 165 yards and two TDs. • The Eagles have won their last two meetings with the Falcons, but haven't thrown a touchdown pass in either of them. • Matt Ryan has made seven career starts against the Eagles, including January's playoff game. He had a 91.1 passer rating in his first five starts against the Eagles, including 13 touchdown passes and seven interceptions. He has an 82.8 passer rating in the last two games, with just two touchdown passes and an interception. He has completed just 58.0 percent of his passes in his last two starts against the Eagles. • During the regular season, just 16 of Zach Ertz's team-high 74 receptions came on third down. But in the Eagles' three playoff games, 10 of Ertz's 18 catches were on third down, including nine that resulted in first downs. • Eagles quarterbacks didn't throw an interception in the red zone last year in 77 regular-season and post-season attempts. Their last red-zone interception was in Week 14 of the 2016 season, by Carson Wentz. It was his one and only red-zone interception that year. • Falcons wide receiver Julio Jones has 585 career receptions and 43 touchdowns. But he has caught more than two red-zone touchdowns just twice in his seven NFL seasons. He has just three red-zone TDs in the last two years. • The Eagles are tied for 19th in strength of schedule. Their opponents have a 126-130 (.492) record. Nine of their 16 games are against teams that had a .500 record or better last season. They have seven games against 2017 playoff teams. • The Eagles will travel 20,290 miles this season, including trips to London, Los Angeles, Tampa and New Orleans. That's the fifth-most travel miles in the league this season. • Carson Wentz had 27 rushing first downs last season before he got hurt. That was the fifth most among quarterbacks in the league. The five in front of him: Cam Newton (Panthers) with 47, Russell Wilson (Seahawks) with 36, DeShone Kizer (Browns) with 32, Dak Prescott (Cowboys) with 29) and Tyrod Taylor (Bills last year, Browns this year) with 28.